After the Model 3, Tesla’s ‘solar roof’ is probably the company’s most anticipated product of 2017, which brings some scrutiny to its plans for production – not unlike the Model 3’s production program. In order to bring to market its new series of ‘Solar Roof’ products, Tesla announced last year that they are bringing together a lot of technologies under one roof at their newly acquired factory in Buffalo, now known as ‘Gigafactory 2‘. It includes tech developed in-house by Tesla, some tech by Panasonic, and tech from SolarCity and its subsidiaries. Elon Musk may be a workaholic, but in his spare time he’s quite fond of video games. His first programming project was a Space Invaders-style game and he’s recently tweeted about his enjoyment of Blizzard’s Overwatch. So how better to appeal to him than by building a video game recreation of Tesla’s Gigafactory? That’s what a team of Lithuanians thought, anyway. 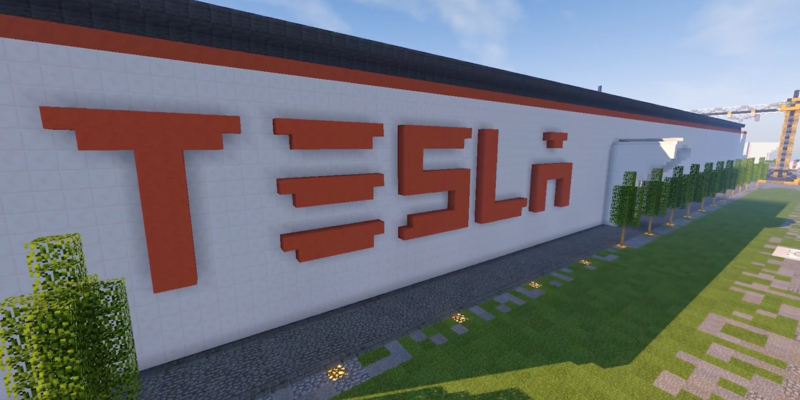 41 gamers spent two days building and livestreaming a mockup of Tesla’s Gigafactory inside Minecraft, a “sandbox” videogame which lets players build an almost infinite variety of structures inside a virtual world. Ever since Tesla CEO Elon Musk announced that the automaker will decide on a location in Europe in 2017 for what the company has been referring to as ‘Gigafactory 2’, several countries have launched efforts to convince Tesla to build the plant in their country. Tesla CEO Elon Musk and CTO JB Straubel are in Germany today to announce the acquisition of a German engineering group, Grohmann Engineering. Following the announcement, they held a press conference during which Musk emphasised that Tesla is planning “significant investments” in Germany and the conversation quickly moved to Tesla not only investing in engineering in Europe, but also in production.